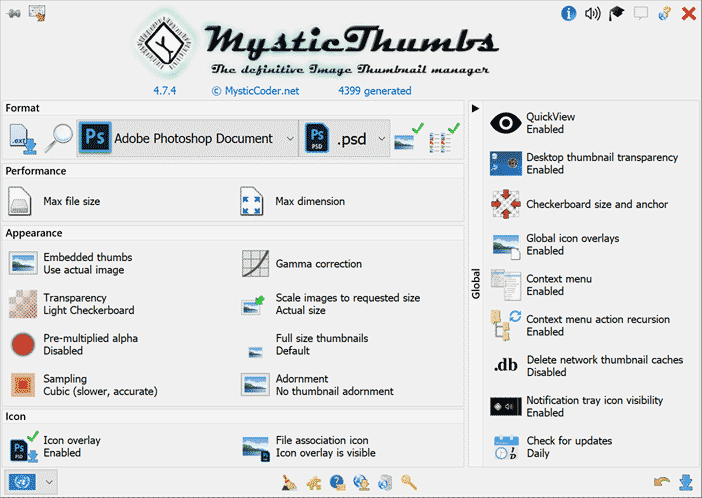 MysticThumbs - Image thumbnails for Windows Explorer. 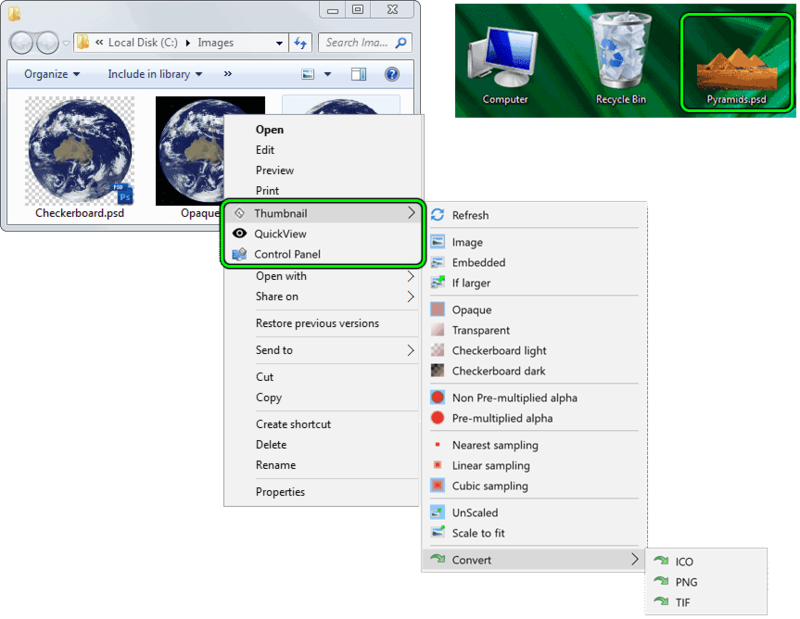 Unleash Windows File Explorer with Thumbnail and QuickView support for most popular File Formats ! Recommended for photographers, artists, content creators, printers, game designers etc. 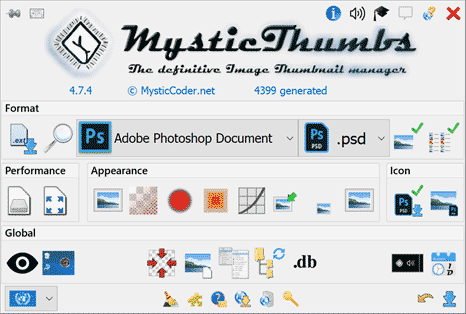 MysticThumbs generates thumbnails of many image formats not natively supported by Windows. It plugs into Windows Explorer so you don't have to run a separate application to preview your images, see them all in the native shell and Open/Save dialog boxes in all 32 and 64 bit applications. The fully configurable control panel allows complete thumbnail and icon overlay customisation, with options like transparency, thumbnail borders, scaling, blending, embedded thumbnail selection and more. Compound file support for files such as HTML, Maya and EML that use external files to make a complete image. Options are controlled on a file type / extension level or if required on specific files through context menu control in Explorer. QuickView - if you miss your Apple Mac then press the Space Bar to QuickView files. High DPI support for the vision impaired and extra high resolution displays. Photoshop, PaintShop Pro, SVG, RAW Photography images, DirectX, Targa, PowerVR game textures and all sorts of other file formats never looked so good in Explorer. No need for any other application to see your thumbnails and quickly preview your images. All suported file types are all fully configurable. Transparency support - opaque, transparent, checkerboard options to help clarify transparent thumbnails against window backgrounds. Very lean and optimised, Win32 code only. No bloat libraries like .NET or MFC. All rendering is GPU optimised where appropriate to improve performance. 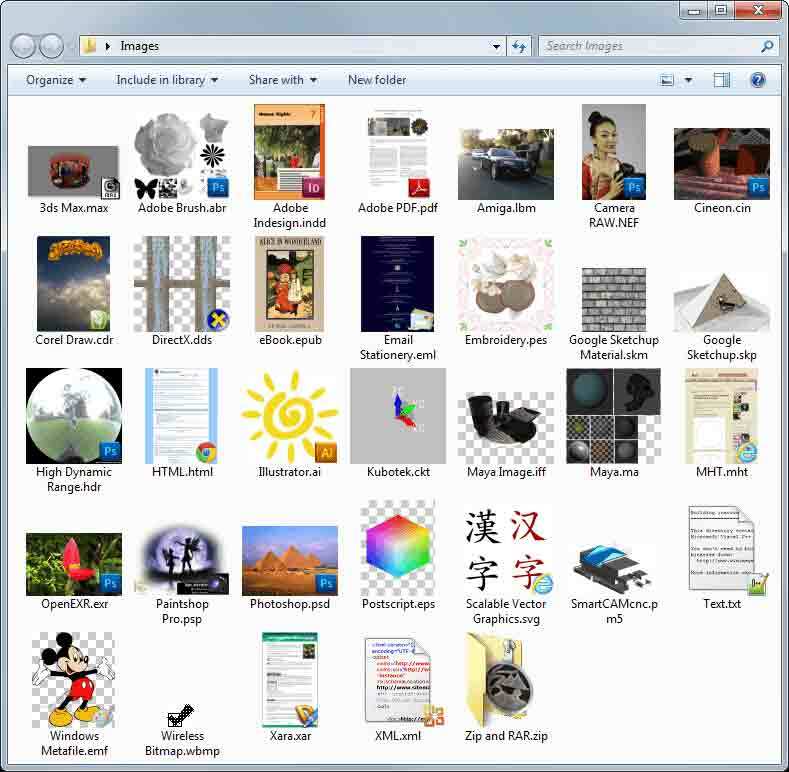 Individual image customisation via context menu. Embedded thumbnail or full image extraction. 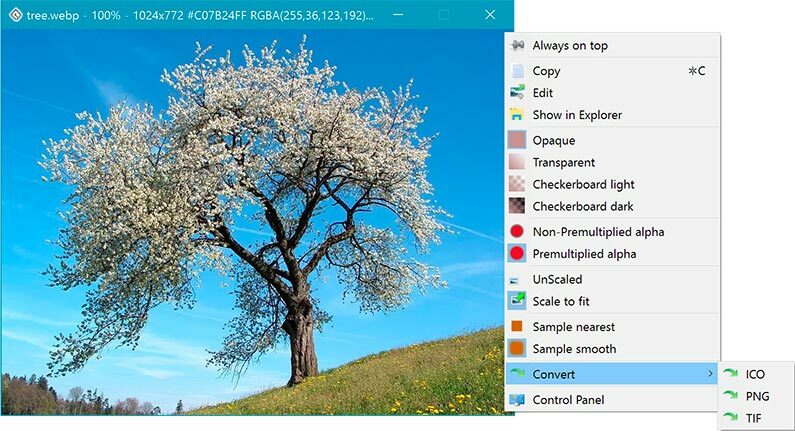 Enhanced support for Windows native supported images (JPEG, PNG, TIFF, BMP, GIF). WAV sound files displayed as a waveform. Customizable file type icon overlays. Thumbnail adornment option, shadow or flat (no frame). 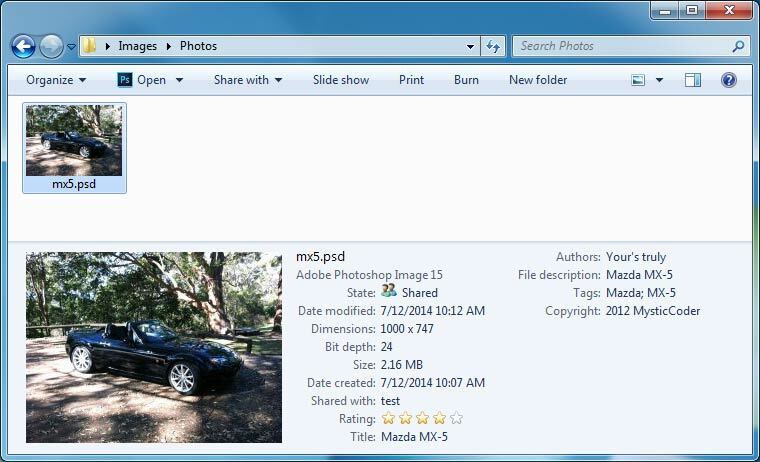 Per image adjustments via context menu. Force transparent thumbnails on desktop option. Regular updates as the application evolves. Bug fixes & feature enhancements included in license maintenance. Plugin support so you can add your own formats. Languages: English, Arabic, Chinese, Dutch, French, German, Greek, Hebrew, Hindi, Italian, Japanese, Korean, Portuguese, Russian, Spanish, Swedish, Ukranian. See a more complete feature list here.